I had two different kids ask me two questions over the last week that just had me shaking my head. I’m sure that every parent wonders how their children can be so clueless sometimes, but with the world changing more and more quickly each day, kids probably say the same thing about their parents. Still, it was the simple questions this week that had me perplexed. I was taking one of the twins to her open house at North Park. While sitting in the back of the car, she asked a simple question out of nowhere. “What are phone books?” I was so shocked that I had to ask her to repeat the question. What is a phone book? What did they do? I had to explain how phone books worked. Phone books used to have everyone’s phone number in it. When you wanted to call someone whose number you didn’t know, you would have to look it up in that book and hope that they weren’t unlisted. The same went for businesses. If you wanted to order a pizza, you either checked the magnets on the fridge, or you looked them up in the phone book. Sure, there were numbers you had memorized, but the phone book was really handy. So, her follow up question was why didn’t we just use the contacts in our phones, or just look them up on the internet? I tried to explain that we didn’t have cellphones or the internet when I was growing up. If you were lucky, some of the newfangled cordless phones had speed dial memory for a couple of numbers, but those were generally reserved for grandparents or the number to call into Harrison’s in case of an emergency. As for the internet, we didn’t have anything like that. We didn’t even have computers. When I was in elementary school, Washington Hunt had a single, Apple IIe computer that went from classroom to classroom for a week at a time. If you were lucky and you finished your classroom work, you might get a chance to sit down at the computer and play a couple of games that the school had on a 5 ¼ floppy disk. 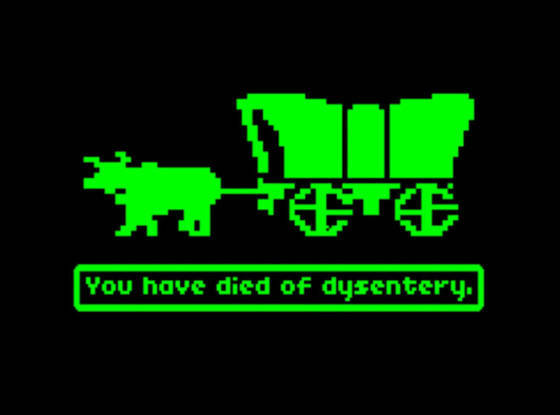 The games I remember were “Lemonade Stand” and “The Oregon Trail.” “Lemonade Stand” was a game where you had to purchase the ingredients to make lemonade, advertise, and not run out of money. We all thought it was a great game, never realizing that it was a game to learn math. I was going to be a lemonade business tycoon. I would make billions, which, of course, would lead straight to the White House. We all hoped that a cloudy day didn’t bring a virtual thunderstorm during gameplay. “The Oregon Trail” was another educational game that was designed to teach us about the harsh reality of living in the 19th century, and the hardships faced by settlers as they moved ever westward. 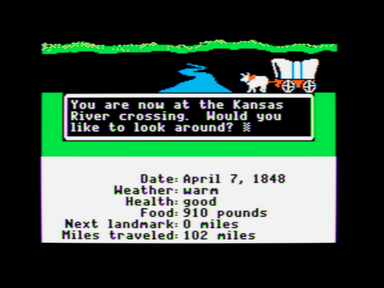 The player was the head of a party of settlers who started their journey in Independence, Missouri, and (hopefully) completed it in Oregon. “You have died of dysentery” was a common occurrence. Along the trip, there were historical sites where decisions had to be made that impacted your group of settlers. No matter how many times we died, we would play that game every chance we got. Computers were a novel idea for us in 1980. The second thing that happened was while we were watching television. Corliss asked if we could just skip through the commercials. Granted, we rarely watch regular television. I would guess that 90% of the television watched in our house is Netflix or Amazon. There are no commercials and no wait for the show. It’s sure not like it was when we were kids with three network stations, PBS, and a UHF station. These kids don’t have to wait a week for the next show to come out. It’s all already there on the TV now. Then the remote stopped working. No matter what I try, I cannot get it to work. Honestly, it’s been trouble since I got it, but I’ve made it work enough for me. Well, now it doesn’t work at all. No matter what I do, it is just not functioning. The girls are moaning about it. I would like to remind them that when I was a kid, I was the remote. If the channel needed to be changed, it would be my job to twist the knob to the right station. And if we were going to UHF, I would have to push in on that knob to help clear the signal. My parents had an aerial on the roof of the house, and we had a control in the house where we could change the orientation of the antenna, depending on what channel we were watching. As the antenna slowly made its way around the compass, the channel would start to emerge from the chaos of static until there was something watchable. Especially fun was watching the blacked out Bills games from the Canadian stations. There was nothing quite like listening to French announcers call the game. Sometimes, when we were bored, we watched the French version of Sesame Street. It didn’t really help. I still don’t know French. But I do love cookies. Yes, the times they are a-changin’. They are always changing. Sometimes, they change for the better. Sometimes they change despite our best efforts to keep things the same. Hearing my kids question some of the things from my youth made me laugh. It doesn’t seem all that long ago to me, but to them, it’s a whole different world. It was exactly the same between our parents and us. The more things change, the more they stay the same. Craig Bacon still remembers putting foil on rabbit ears to get better reception. Now the foil is used to block reception.